Simply telephone us on 01305 756571 to place a home delivery order or shop online. Shop online and pick up your shopping any time from 2 hours to 7 days after* you've placed your order (or you can order further in advance if you're really organised). *Exceptions apply at peak times, click here to find out more. Take COOK on holiday with you! Let us COOK for you whilst you enjoy your time away. Our friends at Ellwood Cottages also have 3 beautiful cottages in the peaceful hamlet of Woolland where we can deliver to your door. And if you're booking the Jailers House we can deliver directly to your door The Jailers House, 23 Newberry Road, Weymouth, Dorset, DT4 8LP). Our local delivery service is available in the following postcode areas: BA8, BA20, BA21, BA22, BH19, BH20, DT1, DT2, DT3, DT4, DT5, DT6, DT8, DT9, DT10 and DT11. If you’re planning an event for a charity, club or other community group and need food for 20 people or more, we might be able to help with our 30% Community Kitchen discount. Our staff can also help with menu planning and tips on COOKing for a crowd. Ask in store for more information or click here. 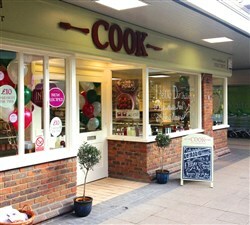 New parents, you can get 10% off the entire COOK range for six months. You’re going to have your hands full, so let us do some of the cooking. We prepare all of our food by hand, so you can enjoy meals that look and taste as good as those you’d make yourself. We give new parents a 10% discount for 6 months to help out a bit.